Thousands of beds were blocked this winter by patients healthy enough to return home, according to data obtained by BBC Scotland. Over a four-week period, an average of 1,216 beds per day were unavailable to incoming patients in hospitals across the country. A tenth of all these delayed discharges occurred in two NHS Grampian hospitals. The new figures come in the wake of the Scottish government announcing £100m in funding to tackle the issue. 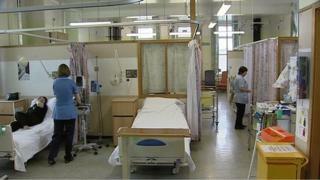 Health Secretary Shona Robison said the figures "aren't good enough" but blamed the position the government inherited. She said: "We inherited a much worse situation with people delayed over four weeks being three times what it is now. We did manage to get it down to almost zero when I was public health minister and I am absolutely determined as cabinet secretary for health to get to that position again." Scottish Labour's health spokeswoman Jenny Marra described the bed blocking figures as "really worrying". She said: "Bed blocking has a real impact on our whole health service and the operation of our hospitals. It is something the government needs to get on top of soon." Use the INTERACTIVE DASHBOARD developed by BBC data journalist Marc Ellison to see which board - and which individual hospitals - experienced the worst bed bottlenecks over the Christmas period. Bed blocking, or "delayed discharge", is when a patient is judged clinically ready to go home but continues to occupy a hospital bed while plans are made for appropriate follow-up care. Care packages may mean arranging places in care homes, care in patients' own homes, or adaptations to be fitted to their homes, such as grab rails. Bed blocking causes a bottleneck in hospitals, as more people cannot be admitted to a ward until existing ones have been discharged. It is often the hidden reason for long delays in accident and emergency departments. Recent figures show bed blocking is also a problem south of the border. NHS England reported 139,156 days where patients were stuck in beds, unable to leave, in December. But while this figure is far more than the 31,610 reported in Scotland for the same period, the NHS in England caters for a population 10 times the size. One of the ways the NHS hopes to tackle bed blocking in the long term is by running hospitals more like airports or supermarket checkouts - with extra resources at times of peak demand to keep customers flowing through. The idea comes from a US organisation called the Institute of Healthcare Optimisation. When its methods were adopted by a children's hospital in Cincinnati, not only did it find it didn't need to build a multi-million pound extension, it discovered it already had more than enough beds. The work in Scotland is at an early stage though. There are lots of reasons why people stay in hospital unnecessarily. It's not just an issue created by a lack of social care. Sometimes people are waiting for scans or diagnostic tests. Work is under way to find out where the delays are, before plans can be created to improve the flow of patients through hospitals. The NHS's information unit only provides figures on the number of lost "bed days" on a quarterly basis, and only at a health board level. But the data obtained by BBC Scotland - collated from a series of co-ordinated freedom of information requests - gives a more revealing snapshot of how delayed discharges varied from hospital to hospital during the busy winter period. The figures suggest the strain was felt most in Grampian, where Woodend Hospital in Aberdeen reported 1,789 blocked bed days between mid-December and mid-January. Woodend regularly had 70 beds a day blocked by people who were ready for discharge and, on some days, the number of patients ready for discharge exceeded the number being admitted. Aberdeen Royal Infirmary - also run by NHS Grampian - experienced the second-highest number of bed-blocked days of any Scottish hospital. A joint statement from NHS Grampian, and the councils of Aberdeenshire, Aberdeen City and Moray, acknowledged that delayed discharges were "deeply frustrating for a patient". But the public authorities stated some of the challenge was due to a lack of caregivers. A statement said: "We have a number of schemes which are aiming to make a career within care more attractive and more sustainable but these are long-term changes." The statement also acknowledged that a number of elective procedures over the four-week period were postponed due to a lack of available beds. But despite this, the board warned "it would be overly simplistic to draw a 'line of sight' between delayed discharge and surgical cancellations". After NHS Grampian (7,197), the most blocked bed days were reported by health boards in Glasgow (5,865), and Lanarkshire (4,116). By contrast, some hospitals seemed to be able to discharge patients quickly. Hospitals in the Borders rarely had any blocked beds, and there were also very few in Highland hospitals. Various Scottish governments have implemented a range of plans to try to reduce bed blocking. After a period of dramatic decline between 2001 and 2008, the number of delayed discharges has begun to creep up again in the last year. Figures from last October showed a rise in the number of patients waiting longer than four weeks to be discharged. Health Secretary Shona Robison said it was her "top priority" to reduce bed blocking. The government hopes that legislative changes due this April will make a difference. Ms Robison said: "I don't want people's loved ones stuck in hospital when they should be at home or in a homely setting. "I want, over the course of this year, to eradicate delayed discharge out of the system and I'm absolutely determined to do that." Scottish Labour's Jenny Marra told BBC Scotland: "We know that delayed discharge is the biggest problem [in] bed blocking in our health service, because it has a massive impact on the whole system. "In the winter crisis we've seen in A&E, bed blocking is one of the main reasons for that because doctors and nurses can't get patients to flow through the hospitals because beds are being blocked." Scottish Lib Dem health spokesperson Jim Hume said SNP ministers had "taken their eye off the ball". "Scottish Liberal Democrats have long warned that cutting hospital beds without putting adequate community resource in place will only increase the pressure on our hospitals," he said. "People will wonder why the SNP government is yet to recognise the real problems NHS staff and local communities have long known." Council social care budgets are to be merged with health budgets - forcing both to work closer together to move patients more quickly into cheaper home and residential care. But in the interim, the Scottish government announced £100m in funding which, invested over three years, will be used to help health boards and councils provide support packages for people in their own homes. NHS Grampian will receive more than £9m - nearly a tenth - of that funding. A Scottish government spokesperson added that "a further £10m Winter Resilience Fund was also made available in December, which is focused on delayed discharges".